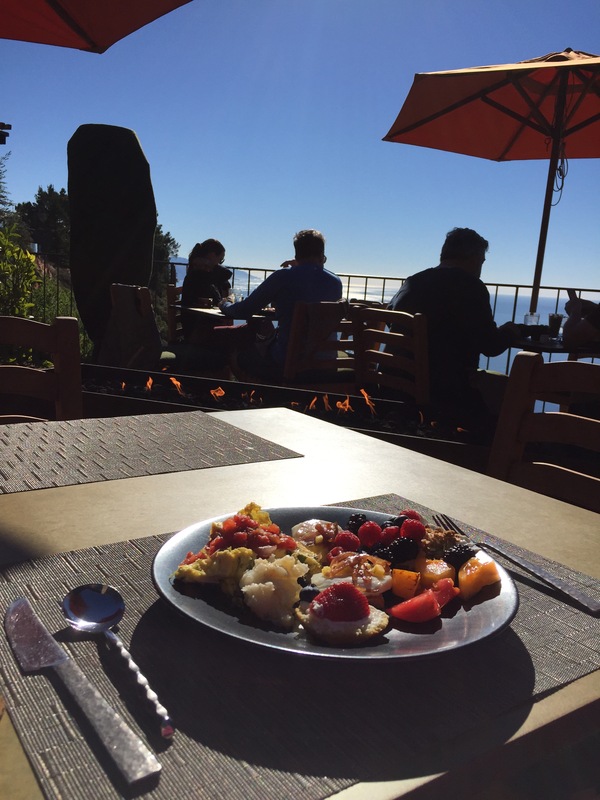 This is my first morning and full day to be here in Big Sur, and I certainly started it out right! I woke up before sunrise and walked the entire area in my robe and slippers with my big camera in tow. This early bird got all the worms. I saw the sunrise over the mountains then quickly walked across the path to experience the sea sunrise view as well! After taking it all in, I went back and made an espresso and relaxed a minute with a good read on the balcony. By 8:30 I was doing YOGA IN A YURT! It was a hot cozy little yurt with a class of about 7 of us in the circle. Although I didn’t get a pic of the yurt, I captured a shot of the sculpture lined trail I ran down to get there. There was a smorgasbord of food offered for breakfast at the resort restaurant. I could get used to this view for breakfast every morning. Unlimited coffee drinks and juices complete this wonderful breakfast. I forgot to mention I dined my last two amazing meals here with a few movie stars and producers. Actresses Carla Gugino and Marley Shelton along with producers Beau Flynn (Marley’s husband) and Sebastian Gutierrez (Carla Gugino’s partner) were staying here all weekend as well. Side note: Later this day we ended up all sharing wine in the jacuzzi, watching the sunset, and witnessing this blue phenomenon (we later found out was a Navy missile testing) together. Everyone was so happy and friendly!